Sterilite storage drawers are available in multiple sizes and styles. These Sterilite drawers are available in case pack quantities so you can take advantage of wholesale pricing discounts. Depending on where you need to fit your Sterilite storage drawers, you might appreciate the small Sterilite Shoe Drawer or you might find that the 27 quart drawer or 16 quart drawer are better for your space. If you need extra large drawers, Sterilite storage drawers can be stacked on top for vertical storage. Each of these Sterilite drawers features a clean white frame with a clear plastic drawer. Make fancy Sterilite drawers and add personality with a little tape, scrapbook paper, and a little time to customize these Sterilite drawer organizers. Use a Sterilite drawer organizing in your bedroom, bathroom, office, or play room. 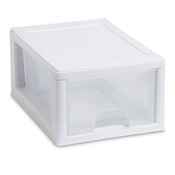 These Sterilite drawer containers come in handy for craft supplies, toiletries, or other small items. These Sterilite plastic drawers also have free shipping every day. Sterilite plastic drawers make finding items easier. The gliding motion allows you to store items inside the Sterilite drawer organizer and still be able to access those items even if they are stacked on top of one another. The clear base of the Sterilite drawer storage containers means you can find the items inside without having to open each one. Buy Sterilite drawers wholesale to save.